Society finches are rivaled only by Zebra finches in their willingness to breed in small cages. This is a guide about breeding Society finches. I bought 2 Society finches and about 2 months later they wanted to nest in the food container. I bought them an actual nest and they didn't even want it in there with them so I just got small pine tree dried leaves, cotton strings, and pieces of fluffy Bounty napkins. They seemed comfortable with their nest and after about 2 weeks I saw 4 eggs. 18 days went by and on the 18th day in the evening I found all 4 babies dead! I am so upset, poor things! They had 1 cuttle bone, food all the time, and water. I don't know what happened! I'm guessing the nest was too small and they stomped on them and killed them. I did see both parents sitting in the nest until the time when I saw the dead babies. So now I want to know how soon do I provide nesting material, which I am buying this time and what is the most secure type of nest to put on there? I know once the eggs hatch to cook oatmeal or boiled eggs or veggies. I took a look on the 17th day and the eggs were still there on the 18th they hatched and died. I think you could wait a month and try again. Awww....that is very sad and I send you my sympathy on the loss of the little birdies! These are very fragile creatures in general and there are so many factors in the process of laying eggs and having live babies that what you experienced is common. You may want to talk to a local vet who has experience with birds and get their take on ways to increase the chances of viable chicks. You may also want to see if their is a local birding support group you can join. Your Humane Society may know of others who have pairs and are in the same situation as you. You will want to Google for your local branch! Post back with updates! Sending prayers!! My society finches started to breed as soon as I brought them home and ended up with a third beautiful beige finch. Lately I noticed that the parents were pecking and pulling its feathers out. Do I have to separate the baby or can I put another nest in the cage for it? You need to put it in another cage. 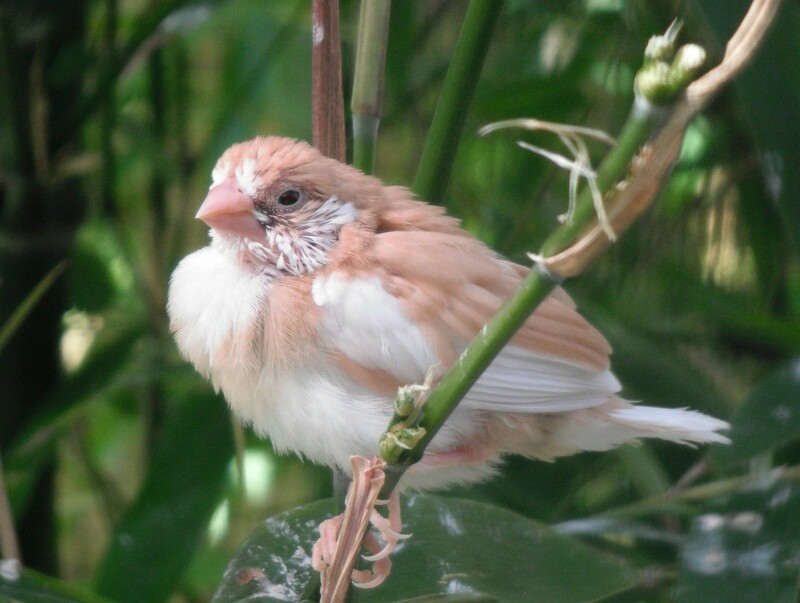 I have 2 white and brown Society finches and my female laid eggs. (2 so far). After they hatch, what do I provide for the babies, so the mom can feed them? Also, should I remove the male from the cage? When the adult finches eat there own food they will regergate in the babies mouths. In the meantime you can boil an egg and mash it very very fine and feed it to the adults. Make sure it is room temp. After 2 days throw the remains of the egg as it will get sour. Boil another egg in a couple of days or once a week and feed again to the adults. Cook plain oatmeal, and baby food is good for them. The adults finches will feed their babies until they feel that they can eat on their own. When the female comes out to eat, the male will go and sit on the eggs to help out. He will also feed the babies. When the babies have hatched they are smaller then a jelly bean. Makes you wonder how something that small can survive. I hope this has helped you some.